BAJO XINGÚ, Brazil, Nov 24 2011 (IPS) - Luiz Cardoso da Costa was horrified as he watched the Amazonian manatee, a large docile beast, bleeding out from the knife wound he had dealt it, yet greedily gulping down grasses as if eating could somehow stave off death. He was not expecting such an agonisingly drawn-out death. And it led him to swear off the hunting of these aquatic mammals, also known as seacows, which can reach sizes of up to half a ton of meat, fat and hide, which fetch a high price on the black market. He had decided to use a knife and aim for the animal’s heart, because the traditional method of killing Amazonian manatees (Trichechus inunguis) in Brazil seemed too cruel: sticking rods into their nostrils so that they die of asphyxiation. But what provoked Da Costa, formerly a “great predator”, to give up all forms of hunting forever was witnessing some 800 turtles being loaded onto a boat destined for Manaus, the central metropolis of the Amazon region, in northwestern Brazil. On that particular occasion, 13 years ago, he himself had sold “only around 20” of those 800, but the sight of such a huge number of dead turtles together shook him to the core. His conversion was dramatic. Today he is the heart and soul of environmental protection in Tabuleiro do Embaubal, a group of more than 100 islands in the final stretch of the Xingú River, in the eastern Amazon, whose beaches are the principal known remaining breeding grounds of Amazon turtles. Thousands of females gather here in September and October, especially on the beach in Juncal. They dig holes in the sand to serve as nests, lay their eggs, cover them up with sand, and then return to the river. 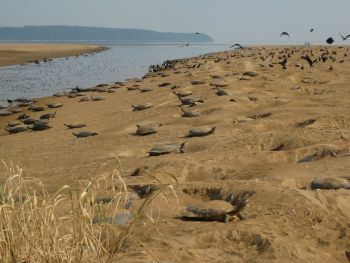 The spectacle of sand flying through the air as multitudes of large turtles dig their nests and lay their eggs could be a major tourist attraction some day, believes Saloma Mendes de Oliveira, secretary of the environment in the municipality of Senador José Porfírio, which includes the Tabuleiro do Embaubal archipelago. As well as a source of revenues, this would also promote the commitment of local communities to the preservation of nature, she added. For now, the large gatherings of turtles makes them especially vulnerable to hunters, who continue to take advantage of the high prices for turtle meat and eggs, despite the fact that their capture is an environmental crime punished with heavy fines and even prison sentences in some cases. This is why efforts are being stepped up to monitor the beaches during the “summer” or low-water period between June and November. Since September, Da Costa has been jointed by another 20 rangers. These are people hired by a company called Biota, created through an agreement between the municipal government of Senador José Porfírio and Norte Energia, the consortium awarded the contract to build the Belo Monte hydroelectric power plant. Norte Energia is responsible for monitoring and mitigating the impacts of the two dams it will build as part of the project. A good deal of controversy surrounds the potential effects of this energy mega project in the Amazon region, whose total capacity of 11,233 megawatts will be limited to 40 percent effective capacity, on average, due to the sharp variation in the flow of the Xingú River. Norte Energia “hasn’t explained anything to us,” said Da Costa. His fear is that the river’s water levels will drop, leading to drier “winters” or high-water periods on the Embaubal islands. If the wetlands that are usually flooded during the high-water period dry up as a consequence, this would deprive the turtles of their source of plant food, which means they would be thinner and lay fewer eggs, he explained. However, this scenario is unlikely, according to Juarez Pezzuti, a biologist from the Federal University of Pará who is coordinating studies of reptiles in the Xingú River basin. The flow of the Lower Xingú, the 220-km stretch of the Xingú River between Belo Monte and its mouth, is determined by the Amazon River, which receives its waters along with those of the more than 1,000 rivers in the Amazon Basin. The Amazon River, vastly larger and faster flowing than its tributary, operates as a barrier to draining. This is why the water level of the Xingú would only drop lower than normal if the same thing happened in the Amazon River. In addition, both rivers are influenced by the tides of the Atlantic Ocean, despite the fact that it is 400 km away. Norte Energia denies the possibility of such an impact, but its conclusions are not based on any serious foundations, she maintained. The consortium only recognises an “indirect influence” of the Belo Monte project on areas that will not be flooded, but they will suffer equally serious damage as the Volta Grande, the rocky 100-km stretch of river whose waters will be partially diverted to feed one of the Belo Monte dams, said Oliveira. The dam will retain sediments that are needed to maintain the beaches of the Embaubal islands, whose height is crucial for the successful reproduction of Amazon turtles and other species, noted Pezzuti. The greatest losses of eggs before they are hatched are due to increases in the river’s water level caused by unusually strong rains. But these are unpredictable and uncontrollable enemies for rangers like Da Costa, who is responsible for preventing human and natural predators from endangering the fauna of the Tabuleiro do Embaubal. Peasant farmer Manoel Nader witnessed the turtles laying their eggs on the beaches of Embaubal when he joined the group of rangers. “It was incredibly moving. I had never had the chance to see it before,” he said, despite having lived almost all of his 48 years in the municipality. The main problem is not the local fishermen, who are known and unarmed, capture only a small number of animals to eat themselves, and could be persuaded to stop, said Da Costa. The real threat is posed by traders “from outside” who supply turtles to big cities like Manaus and Belém. The only way to stop them is through police enforcement, he stressed. The rangers in Embaubal are civilians, employed by Biota or the municipal government, like Da Costa, and have no law enforcement powers. The Brazilian Environmental Institute (IBAMA), which has this authority, transferred its responsibilities in the archipelago to a private foundation, which gave up the work two and a half years ago. This left Da Costa as a solitary defender of Embaubal, often without the boats or fuel needed to travel among the islands, and sometimes a powerless witness to the capture of huge numbers of turtles. He has devoted ten of his 47 years to his mission of protecting the turtles. He lives in the “Base”, a large wooden house with an observation post that allows him to monitor Juncal beach, 600 meters away, during the daylight hours. He only rarely visits his family, a wife and six children who live in the city. He earns very little and has received numerous death threats. But he feels gratified.